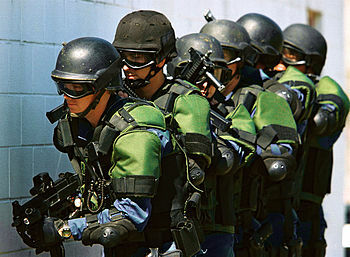 United States Customs and Border Protection officers, fully armed and armored for a counter-terrorism operation. In his address to Congress earlier this month, President Donald Trump said, “We will soon begin the construction of a great, great wall along our southern border” to “restore integrity and the rule of law at our borders.” Now that the U.S. Customs and Border Protection (CBP) agency has begun issuing RFPs — requests for proposals — the wall is also going to be big and scary: “The wall design shall be physically imposing in height,” according to CBP officials. It will be at least 18 feet in height, but CBP’s “nominal” goal is more like 30 feet above ground, and another six feet below ground (to discourage tunneling underneath it). It’s also going to be thick, as one of the requirements is that it must take someone at least an hour — and ideally more than four hours — to bore a hole in it large enough to allow him to crawl through it. That, theoretically at least, would allow enough time for border agents to respond to the attempted breach. Its RFPs will entertain alternatives to the concrete wall many have already envisioned, responding to border agents’ suggestions that it have a “see-through” component, similar to some of the 653-mile-long border wall already constructed and paid for by previous administrations. The CBP is bidding out the entire 2,000-mile wall, that will cover even extremely rough terrain and will presumably be replacing the existing wall. And, finally, the finished wall must be “pleasing to the eyes,” according to the RFP. More than 700 companies are responding to the bid, and it will take some time for the CBP to sort through the replies before beginning the wall’s construction. This, it is likely to turn out, will be the easy part. The hard part is still to be faced, addressed, and resolved. Much has been said and written about the ultimate cost of building the wall, with estimates ranging from $8 to 14 billion (House Speaker Paul Ryan) to more than $20 billion (Salon magazine). Even more has been written about who is going to pay for it. The New American suggested that interdiction of the cash flow of Mexican drug money would be more than enough to carry the day. Initially, however, it will be the American taxpayer who will be funding at least a major part of the project’s startup costs. Representative Harold “Hal” Rogers (R-Ky.) cites obstacles to the wall such as Indian reservations, national parks and forests, and terrain that is so rugged and inhospitable that it doesn’t even make sense even to try to build a wall. And then there’s the Rio Grande River. The middle of the river marks the border between the United States and Mexico and, under a 1970 treaty, any structures built over it must not interfere with its flow. There are other more indirect considerations. There are bound to be some savings as the number of illegals soaking up welfare benefits, subsidized food, housing, education, and medical care will be greatly reduced. In fact, there is some evidence that the flow of illegals has already declined sharply, a fact that anti-Trump-wall liberals are using to question the necessity of the wall at all. There are always ways around any wall that is built. If people cannot tunnel beneath it, they will climb over it, regardless of its height, or bore through it, no matter how thick it might be. There are other borders to the United States, not just the southern one. No one is mentioning it, but once Trump’s wall is completed, will there be pressure to build another one like it along the nation’s northern border with Canada? And then there are the vast stretches of coastline, often populated by politicians who aren’t interested in stemming the tide of illegals but who will actually welcome them into the country in contravention of Trump’s declarations. What about the costs of maintaining the wall once it is built? Will surveillance technology enhance its effectiveness (i.e., drones, eyes in the sky, pressure sensors buried near its base, video monitors)? Will the states be required to pick up those costs? And what about the thousands of new border-patrol agents being hired as part of Trump’s plan? Will they be permanent government employees such as the TSA agents hired under Obama? There’s eminent domain to consider as well. So much of the land on which the wall will be built is private that part of Trump’s “skinny budget” contains funding for dozens of lawyers to sort all of that out. This entry was posted	on Tuesday, March 21st, 2017 at 5:42 am	and is filed under Politics. You can follow any responses to this entry through the RSS 2.0 feed. You can leave a response, or trackback from your own site.